Iconic promotional map of Hawaii from its Territorial Period. 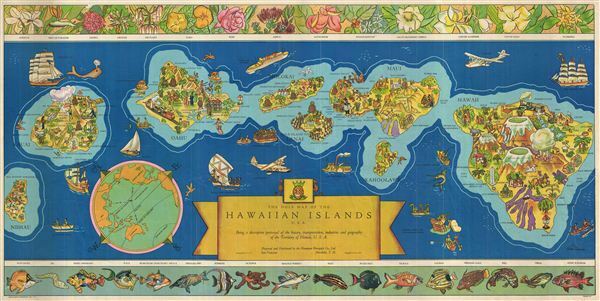 A bright and colorful 1937 pictorial map of Hawaii drawn by Parker Edwards and issued by the Dole Pineapple Company. One of the most iconic pictorial maps of Hawaii from its territorial period, this is an early attempt to highlight the archipelago's wonders and draw tourists. The map covers the eight primary islands and features numerous vignettes highlighting the Hawaiian flora, fauna, history, transportation networks, and curiosities. Images of indigenous flora form the upper border. The lower border is formed by a similar series of images highlighting Hawaii's reef fauna. This map was widely appreciated and inspired Dole to contract a second map of Hawaii in the same style in 1950. This map was printed 1937 by Independent Pressroom of San Francisco and stands as one of the most iconic maps of Hawaii published in the 20th century. Good condition. Some minor damage upper left quadrant, near border. Older fold lines exhibit some wear. Backed on archival tissue.